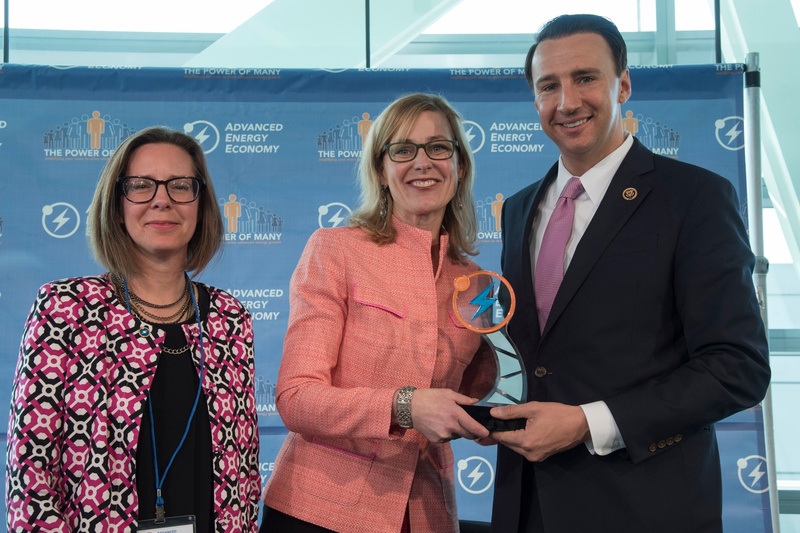 WASHINGTON, March 1, 2017 – Today, Advanced Energy Economy (AEE) announced the national business association presented its Advanced Energy Leadership Award to United States Representative Ryan Costello (R-Pa., 6th District) to recognize his support of policies to expand the $200 billion advanced energy industry in the United States. He was presented the award at AEE’s annual Energy Forward conference held at the Newseum Knight Conference Center yesterday. “Congressman Costello understands that by leveling the playing field for these technologies and unleashing their potential we can use homegrown advanced energy to create American jobs and make the U.S. a global leader in innovation,” Haider said. Specifically, Haider noted Costello’s leadership as an original cosponsor of legislation to harmonize the tax code for technologies like combined heat and power, fuel cells, and geothermal – an effort that finally bore fruit in the recent budget bill. She also recognized his support of legislative and regulatory initiatives to tap into our existing domestic advanced energy resources, such as enhanced battery storage capacity, which would accelerate the deployment of this game-changing technology to manage a changing grid. She also said that, as a member of the House Committee on Energy & Commerce, Rep. Costello has demonstrated his appreciation of what advanced energy technologies can do to provide reliability, resilience, and choice in the electric power system and transportation. “We appreciate Representative Costello’s efforts to spur innovation and enact policies that support the growth of advanced energy that drives economic growth and jobs, while improving our nation’s electricity system and reducing consumer costs,” said Heather O’Neill, Interim CEO of AEE. Veolia North America is an AEE member company that employs 165,000 people globally, 7,500 in the U.S., and hundreds in Pennsylvania, where the company has invested $350 million in capital projects and also operates energy efficient cogeneration systems. Bill DiCroce, President & CEO of Veolia NA, serves as director on AEE's Board. Haider has strong connections to Pennsylvania, as she works and lives in the Philadelphia-metro area, and is a graduate of The Wharton School at the University of Pennsylvania. The Advanced Energy Leadership Award highlights the work of key policymakers to support the advanced energy industry in the United States. Award recipients are chosen based on their actions to back policies that increase deployment of advanced energy technologies that support job creation, increased grid reliability and resilience, and consumer savings. AEE’s Advanced Energy Now 2017 Market Report showed that the U.S. advanced energy market totaled $200 billion in 2016, equal to pharmaceutical manufacturing. Based on U.S. Department of Energy figures, the advanced energy industry also supports 3.3 million U.S. jobs, more than retail stores and double the number in building construction. Advanced Energy Economy is a national association of businesses that are making the energy we use secure, clean, and affordable. Advanced energy encompasses a broad range of products and services that constitute the best available technologies for meeting energy needs today and tomorrow. AEE’s mission is to transform public policy to enable rapid growth of advanced energy businesses. AEE and its State and Regional Partner organizations are active in 27 states across the country, representing more than 1,000 companies and organizations in the advanced energy industry. Caption: Elinor Haider (center), V.P., Market Development, Veolia North America, presents the Advanced Energy Leadership Award to U.S. Congressman Costello (Pa.-6th District) with Heather O’Neill, Interim CEO of national business group Advanced Energy Economy, Feb. 28 in Washington, D.C.